To go with the President's fiery speech yesterday, this is what I made. I am a big fan of that guy so I will refrain from discussing his dog, his wife and his stimulus here. But that man surely inspires, how else do you think me who has to be up by 5:30 in the morning after a midnight feeding break, would start cooking at 9:00 on a work week night. I would have normally just served leftover dal with an omlette but I made this fiery dish instead. Anita's tcharvan-olu was reincarnated in my home but with mushroom & potatoes. I didn't have a goat tied in my backyard and so had to resort to mushroom. It was wonderful to say the least. Taher, therefore excited me and satisfied me and the husband's taste buds fully. To do this cook rice with a little turmeric. Once the rice is done fluff it with a fork so that you can see the grains. Heat Mustard oil to smoking and then mix it with a little salt with the rice. This with the mushroom-olu was bliss. This Kashmiri recipe is there to stay in our Bengali home for sure. I would insist that you use Mustard Oil for both Mushroom-Olu and Taher. Both dishes are very simple and light if you consider the spices, it is the Mustard Oil that lends it the flavor, with any other oil it may taste flat. So go ahead and buy that bottle. Drizzle a little more mustard oil and you are done. At this point you are supposed to add 1/4 tsp of Garam Masala or a Kashmiri Masala. I gave this step a miss but still it was great. In summer my granny soak the leftover rice and next day goes with left over tamarind fish gravy :) or green chilli and raw pearl onion. Thinking itself makes drooling, I imagine with mustard oil or posto, could be something different. The curry is very quick and droolworthy! Aloo and mushroom! Now why didn't I think of this before?! Thanks for sharing it Sandeepa. I never tried to make mushrooms with potatoes, now will surely make this for my brother! Taher je mustard oil er hoye jantam na.. Sounds like killer combination! amar ma o kono din panata bhaat kheto na, amr mashir barite gele ami khetam, kintu chotoder jonne gorom panta (fresh bhaat thanda kore) kore dito knaacha posto diye. I would love that! Visited your blog after a long time.Congrats on the new domain name. Rice e mustard oiler gondho ta thakay jai ki. I love sorser tel, but cant think of it in my bhaat. 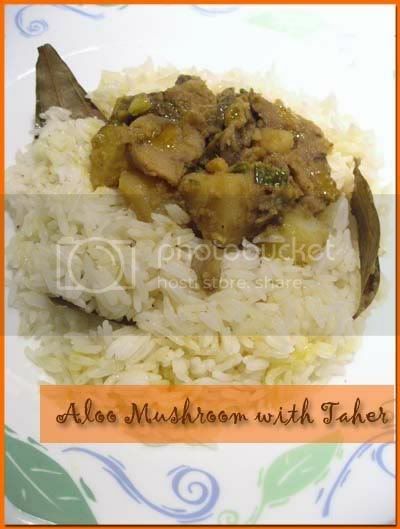 Alu Mushroom ta try kortay hobay, I usuaully make matar-mushroom. Great combo! aloo and mushroom. Taher is something new to me..shall give it a try. Sandeepa, will you be able to put up the recipe of the Paanta Bhat sometime? I made methi-paneer with mustard oil today, from a Punjabi cookbook. It was for potatoes, but I didn't use potatoes. I'm looking forward to lunch. Wow these looks so yummy delicious, i can imagine how comfoting id to eat this curry with rice, just the thought makes me drool here. Shilpi pointed me towards this blog. I can go on about the awesomeness and how it has already changed my life in the last 4 minutes (I am not being sarcastic). But, thanks for blogging. Yes Sandeepa this combo is soul food. This weekend am making it for my friends. Thanks for this post. I was thinking up the dishes I should be making for my inlaws visit. They swear by mustard oil - though I dont love it! This is gonna be on the menu! Great blog. I have bookmarked it and will be coming back often. 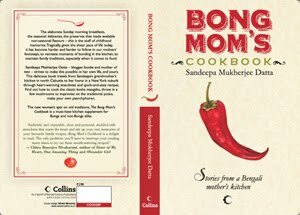 I dont know abc of bong cooking. My sis-in-law sent me the link from US and said that it is a great site. I agree with her. Looking forward to great recipes. I am especially interested in the dals, mutton and sea food :). I guess the soaked rice thing was done all over in those days to preserve the rice. My Mummy loves it so much that she soaks left over rice even now sometimes to have it with thin buttermilk next morning seasoned with a dash of salt and pepper. Tastes great. Though Tambrahm I am in love with mustard oil and always have a stock. The rice you mention is new to me and I am definitely trying this! Mushroom olu sounds great too. Came here some time back too but could not get through to the comment box! I too have mustard oil with rice only when I am having aloo-seddho or similar stuff, but this was definitely great when paired with this dish. I don't have a night light setting to take pics. This was taken by my kitchen light and that too with the little one on my hips. I did not even attempt to take a better one !!! Ami plain bhaat e sorsher tel khai na, except jokhon aloo seddho etc. ei shob thake. Eta anek ta ek i rokom, tobe sorsher tel gorom korle ekta jhaanj hoi, normnally amader ekhaner sorsher tel e jeta prai thakei na. Ummm do I know Shilpi ? Did you make it with M.Oil, that makes all the diff doesn't it ? The first time I tasted mustard oil was in a pickle when I visited Bagdogra and Darjeeling over some school holidays. Did not like the taste of it the firsttime but by the time my vacation was done, I loved the smell & flavor of it so much that I packed bottles of pickles to take back home! The curry sounds & looks delicious, San. And with the mustard oil flavored rice, must've been fabulous! This looks wonderful! As to fennel powder, is it OK to use ground (in a mortar and pestle) fennel seeds? Should one dry-roast them first, or just grind directly? Thanks!! I used roasted and ground, just because I had that left over . You can use ground fennel seeds too. By fennel seeds here I mean the one you buy as a spice. Bhag-gis backyard-e goat bandha chhilona..ta-hol-e ei recipe ta khaoa hoto-na.. I am going to make this exactly as per your recipe, it has a slight departure from Kashmiri, though. By the way all Kashmiri dishes are cooked with mustard oil by default unless ghee is specified. No other oil is used. I am in a good mood to cook roganjosh and reshmi biriyani shortly and will put few lines on kashmiri dishes. Taher traditionally will have bit of akhrot paste, holud, salt and ghee or mustard oil. The mustard oil generally may not be raw but heated, saturated with hing, cooled and stored in bulk for cooking all other dishes. Ar funda dekha-te hob-ne..ei dish ta rendhe janachhi Ka-to bhalo khelam..